Mohanlal, Fahadh Faasil, Nivin Pauly and Dulquer Salmaan have been nominated in the best actor category for IIFA Utsavam 2017. The organisers of the International Indian Film Academy Awards (IIFA) have announced the nomination list for IIFA Utsavam 2017 to honour the best performers in Tamil, Telugu, Malayalam and Kannada language movies released since October 2015. Fahadh Faasil's family entertainer Maheshinte Prathikaram has been nominated in all the 13 categories of IIFA Utsavam, while Dulquer Salmaan's Kerala state award winning movie Charlie has made it to the list in as many as 11 categories, followed by Jayaram's horror thriller Aadupuliyattam. Mohanlal, Fahadh Faasil, Nivin Pauly and Dulquer Salmaan have been nominated in the best actor category. Interestingly, the best actress category is seeing a tough competition with two state award winning actresses competing against each other. While Parvathy bagged the state award for her performance in the 2015 movie Charlie, Rajisha Vijayan received the accolade this year for portraying the role of Eli in Anuraga Karikkin Vellam. Maheshinte Prathikaram, Aadupuliyattam, Charlie, Kammatipaadam and Pulimurugan are competing for best picture category, while Dileesh Pothan, Abrid Shine, Martin Prakkat, Rajeev Ravi and Priyadarshan are named in the best director nomination list. IIFA Utsavam also has the award categories including, performance in comic role, supporting actor, supporting actress, negative role, music direction, lyricist, play back singers and best story. How to vote for IIFA Utsavam? On the right-hand side of the website, click VOTE FOR THE BEST IN SOUTH INDIAN CINEMA. In the newly opened page enter your name, email id, captcha and click on register. Disclaimer: Duplicate votes or any attempt to do so through invalid email IDs is discouraged. These votes will be eliminated. You will receive an authentication code on the registered e-mail id and enter that code to complete registration. 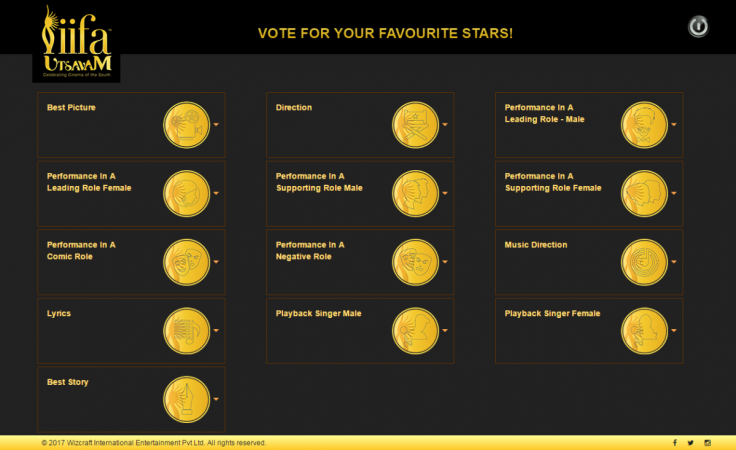 You will be directed to a page where you can select the language and award categories. Register your votes and submit.